My Corpus wiki is ripe. It took me about a month to think over what this wiki will be about. Now it is ready to launch. Lessons begin next March. I believe I have produced an overall site design that includes key sections for the learning purpose, the users/readers involved, and sufficient room for change as we all learn with this wiki. I think it will be a good idea to blog about this. Probably many of us teachers face the same steps and it can be revealing to read about the process. Not just see results and wonder how they made it. There we find the first difference: Blogs are good platforms to record processes and stages. In wikis it is the last version that counts. Of course teachers will agree that the best section in a wiki is the Discussion where you can learn how a community interacted to get those results. But in a blog every step of the way, every journal entry is a final version on its own right. The good think about having finished the first draft is that my mind is free to approach the next step. The how to wiki. This is where networking and connecting (probably in that order) will be crucial to make this experiment a successful project. I am familiar with blogging but this is my first wiki. Blogging has helped me build an information and people network I now resort to. All information is managed by tags in my del.icio.us account. My del.icio.us network is full of teachers and edubloggers far more experimented than I am. I have contacted by blog and mail people who are teachers of English at the same stage of development of their wikis. Listening to Will Richardson answering questions after his presentation at the Connectivism conference, you notice in his tone of voice that he is not worried at all about having the answers. The point is not to know all the answers but to know how to get the answers. He says he has built a network where he will be able to ask and learn whenever he needs. This is the question. Can we teach as we learn? Haven’t all of us sometimes come to the conclusion that all of the knowledge acquired (should I say studied?) at university only clicked in our heads when we started teaching? Not all of us can feel comfortable learning as we go along. I cannot see a good reason why we all should, either. In the implementation of innovations, we are all to have different roles and positions towards them. Should every teacher have a blog or a wiki for her class? To me this sounds as if we all had to consider becoming reporters in a newspaper because it is vital to stay informed. I need literacy to read and process the information. I do not need to learn how to design blogs or wiki projects. I need to know that when I am faced with a wiki or blog I can decide to take part in it or not. I need collaboration literacy. That is all. If we can make our colleagues aware, that’s a promising start. I would not expect much more. 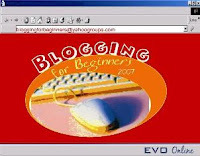 Most blogs online today are not blogging at all and several wikis are a one man show. Even people with high internet skills very often miss the point. -Can they all have a say in this? -At what stage of the project shall we incorporate these voices? Our decision making process has to evolve as much as our newly acquired web literacy. If we are pioneers in our school context or early adopters -to use Carl Rogers terminology- we will have to embrace the distributed nature of the internet and design ways in which decisions can be "distributed" as well. The school, the students, their parents will have a say about what we do online. This learning process for the innovator in context does not sound as thrilling as learning how to use wikis, podcasts and blogs. It would be wonderful if they spoke the language we speak now. But this is what there is. Whether we like it or not. Today I went into the B4B PBWiki to get to know the tasks for week five and ... lo and behold! My FCE Blog has been mentioned on a list of blogs of the week. This means lots of colleagues around the word will be asked to have a look at it as part of their online training. First things first. I’m honoured. Second, this poses a little issue on me. I confess I do not think blog surfing or commenting should be homework at all. At least not my blog project as I conceived it. So I hope no one feels too obliged to pay me a visit (or read this wordy post!). Let’s stop rambling about and get down to the topic in question. As B4B blog is discussing widgets this week, I though it would be interesting to post a little something about my use of widgets and why I try to stay away from them these days. In my FCE Blog sidebar you can find several widgets. I have displayed them in a particular order. Why? Well, not only because design is very revealing about the blogger's purposes and relationship to the reader, but also because this order answers my own needs when I browse blogs. They need not constitute a pedagogical purpose per se. who benefits more from a widget? The teacher-blogger, the audience, the community or our students? A widget is a bit of html code that you add to your template and may or may not have animation (java). A teacher-blogger is an education professional who may be blogging for countless different reasons. Sometimes they do so for their students. By audience I mean anyone stumbling upon your blog. Need not be the original intended audience of the blog. Your students are the ones that can and should make a difference. In class and in the comments section. If you are writing for your students, but most comments or widgets are addressed to colleagues or family and friends something is wrong. There. Much clearer now, I guess. Now a few things about the widgets in my blog. To begin with there are technical considerations. The more widgets you add, the slower the page will load. Not every browser will support them. Your blog will not be perfectly seen everywhere when there are many widgets. These are accessibility issues; therefore, top issues. After all, we all love how the web has made the unthinkable 15 years ago so accessible today. So what I do is to use some widgets in blog posts –particularly those that take some seconds to load. An interesting example is the Frappr map of fcebloggers. I just use a badge on the sidebar and a link to a post to explain how I intend it to be a Guest Map. A curious stat about it: Most people who added themselves to the map have never left a comment. This is interesting because the map creates a sense of belonging, of community building. It opens the door to participate for those who do not feel they have something special to say. And many of them are teachers! No further comments. Oh stats... I just love stats! Then there are stats. Everywhere. Stats speak to the audience, community and students in different ways. The first time viewer might reflect on how far this blog has been viewed or how many times. I guess they may decide to come back based on this. Call it going-with-the-flock principle. To my own students, visual stats have been quite a revelation. They were faced with the fact that the world is watching. This was in my class - I believe- a double edged-sword. Some people who saw the blog being born felt it was just a thing between us. Our blog, period. It gradually dawned on them that the things we write there should make sense to other cultures as well. Otherwise, why not create a private Yahoo group or intranet or moodle? But to blog is meant to network with the world. This is something that everybody uses, students, audience, community. It is a leveller. At first site it is hard to tell who writes there: Is it one of my students, a teacher or an FCE student in Argelia like Mustafa (who writes the sweetest letters calling me "my dear teacher")? The shoutbox is the point where people express more emotionally and fast. A comment requires some thinking that bars people with little time. Note: I do not recommend the widget provider I am using at the moment. For several reasons. Mainly not having RSS to be notified of new messages. You cannot check your blog every single day and it gets easily spammed. There are two widgets that have to do mainly with the community of teachers and educators. My del.icio.us network is full of edubloggers and EFL teachers. All those links would be of little use to students, but it is certainly good to show ourselves as learners in front of them, and to let them see how we choose and tag information. Cocomment is a blog comment/posts tracker and aggregator. It is useful to bring to the fore some comment in a previous post in your blog. I also use it to bring to the FCE Blog the conversations I am having on other blogs – in different languages- about blogging, wikis and education. Another way to expose my learning paths to students. My use of widgets is not exactly didactic. It is all about informing, integrating and showing the audience what this blog deals with. Or what this blog might soon be dealing with because I am conversing about it on other blogs. Above all widgets should help your blog become a meaningful node in an ever growing network. At the beginning of the post I said that I am staying away from them these days. The point is that when we just discover one of these widgets we want to use them instantly. Our own learning need makes us practise on our student’s blogs and adding widgets for the sake of practice is creating a noise in communication with students, audience and community. Widgets are meant to be simple. Learn about them, know what there is available and trust yourself that you will manage to install them pretty fast when you or the purpose of your blog post needs them. The first teachers who saw my blog, teachers who had never seen a blog before, told me things like: “I’m impressed at your cyber-skills”. No further comments made about the purpose or the ideas reflected on my blog. If teachers or students get paralysed and notice you instead of your blog, or they imagine that you have to know all that to have a blog, then we have definitely missed the point.